TPC Overall Rank: #4 out of 2933 rides. Skooters are bumper cars. They are average speed, fun, rerideable, they have a large capacity, and a long duration. Excellent bumper cars! A great cycle, easily manueverable, and they really do pack great power! It seems as if some of the bumps would register on the Richter scale. 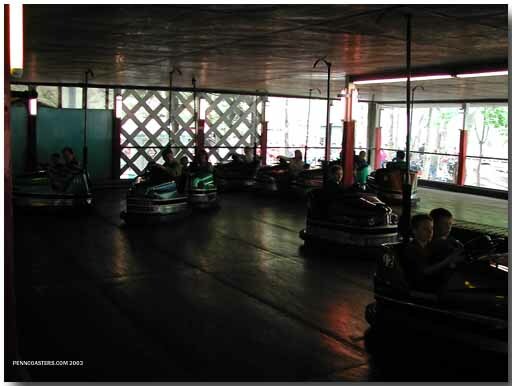 Incredible fun; it's a shame this bumper cars are not made this way anymore. Children who are used to milder bumper cars may not be used to the hits being this intense, but it really is a great ride! There&#39.s not much to say about this ride except that it&#39.s the best. This certainly isn&#39.t a kids ride and if you&#39.re hit hard you will feel it!! Everything about this ride will keep you coming back for more from the classic style to the surprisingly long ride cycle. Not to be missed at any trip to Knoebels! The other reviews sum up these excellent bumper cars. All that I&#39;ll add is the added &quot;charm&quot; of the grumpy man who runs the ride. Hearing him yell out instrutions and yell at people is half the fun. Excellent set of bumper cars that are worthy of being considered the best out there. All of the beautiful Lusse cars are in excellent condition and they rode very well, as they were really fast, handled well, and most notably hit like crazy. I got some insanely powerful collisions off during my ride. Also, it has a very long cycle as well. Wonderful bumper car ride. The heavy cars slide beautifully. The ride is fun even when there are many cars on the track. Not a huge fan of the bumper cars, but these ones are great. The ride lasts a pretty long time, and the speed and impacts are great. These are supposedly the best bumper cars in the country. Alright...alright...so I couldnt help but wonder why on earth bumper cars could possibly be ranked so highly on this site. Well...it probably has something to do with the fact that this ride takes the bumper car medium to a near orgasmic caliber. Between the devastating wrecks, classic atmosphere, and seemingly interminable ride cycle, this ride is just freakishly pure fun. I guess its not everyones cup of tea, however. My friend didnt take too kindly to the jolting and cataclysmic crashes, so she came away disappointed. I, however, fell in love with these things and will certainly be back to dish out some more hell-born carnage in the years to come! Big, loud, classic, and one of a kind. Knoebels Scooters are definitely the best bumper car attraction around.